KONI, the industry standard, coil-over shocks feature lightweight aluminum body construction. Shocks are double adjustable with a unique valving and wide range of adjustment in both rebound and compression. They come equipped with upper and lower rod end mounting eye. STRANGE double adjustable coil-over shocks also feature aluminum body and upper and lower rod ends. Special features are custom valving for particular applications. Both bump and rebound are easily adjustable with side-by-side knobs. AFCO shocks are similar in construction - aluminum bodies and separate adjustments for both bump and for rebound. Main features are a wider range of adjustments for use in special applications. Also, custom valving is available. Also available from each manufacturer are single adjustable versions are reduced prices. Use our vast experience to help you select the correct shock for your application and budget the first time. 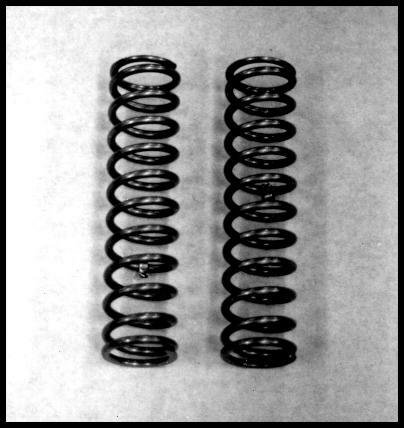 Selected rear coil-over springs have a height of 14" with a diameter of 2 ½”. Springs are available with compression rates from 85# and up in small increments as required. All springs are high quality silicone steel. Please call for a recommendation for your application. S.P.S. is an authorized dealer for Mark Williams and Strange Engineering offering complete race-ready third members with your choice of components. Complete assemblies can be custom built to an individual’s specifications. Ranging from custom rear ends to the latest aluminum or titanium parts, profile milled axles, gun drilled shafts to custom ring gear lightening. Custom gear lightning is available. Axles are specially ordered for your requirements and are assembled by our staff. Chose from Mark Williams or Strange with many options available. A large inventory allows us to supply you with the lightest and strongest components available. 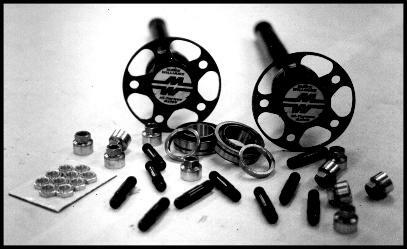 In addition, we stock many standard components such as bearings and studs for that replacement part you need now! SPS gives you quick turn around time and the best prices. Please call for a quote. Chassis builder, F.J. Smith designed this wheelie bar to bolt directly to S.P.S. 4-link brackets. Constructed of chrome moly tubing, the one piece lower strut assembly adds increased strength to the bar structure while making it easier to jack up the rear of the car. Bars are 48" overall length installed. 22" C to C fits 1993-1998 Firebird and Camaro while 20" C to C fits 1991-1998 Calais, Grand Am, Achieva, and S-10 truck. Includes rod ends, adjustable clevis, pit pins, and hardware. Stand alone brackets are also available to fit our wheelie bar on your housing. Bars are chrome plated for appearance and ease of maintence. Custom lengths and widths are no problem!